We released our first UWP Beta in 2015. Since then, Microsoft has released several platform updates and we also made a lot of changes on our side to make our controls fast and stable. UWP FlexGrid performance has improved a lot from the first versions. Now I'd like to share the FlexGrid benchmark application that we use internally. It's similar to what we did for WPF but doesn't include any competitors. Running a single test is handy if you want to profile some specific use case. Note: if you need comparable results for different tests, don't change the window size while the tests are running. Actual view port size affects performance numbers as larger screens take more time for layout and leave less space to virtualization. After running some or all tests you can save the results in an Excel file. The main point of interest here is how to measure time for complex operations with async UI updates. After several experiments, we found what we think is the most appropriate way to get exact moment when UI has finished all updates. The full source code is attached, so you can give it a try. We will be glad to hear any feedback if you think that we can improve something. It gives us 12 columns of different types. Let's explain some implementation details about specific benchmarks. 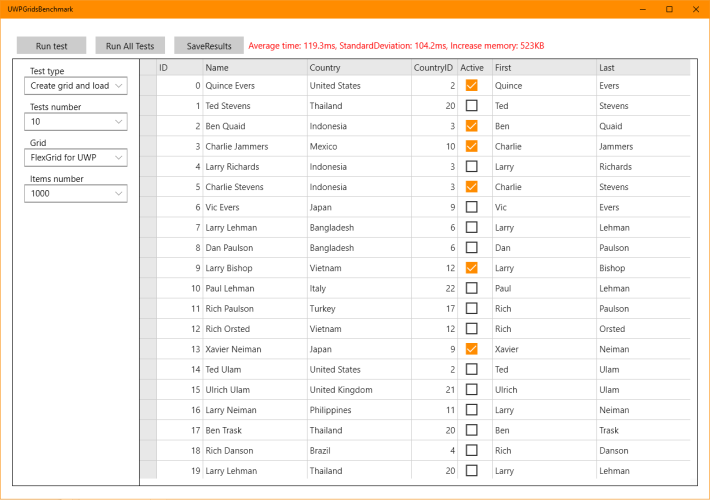 This benchmark creates a user control containing FlexGrid, inserts it into visual tree, and fills with data. This benchmark sets the FlexGrid's ItemsSource to null to clear both data and auto-generated columns, and then sets ItemsSource to a new C1CollectionView instance. Note, it's important to use DeferRefresh. Otherwise it will take more time. We thought it would be nice to mimic end-user interaction in this test, but didn't find good way for this. So we decided to stick with bringing specific row into view (used FlexGrid.ScrollIntoView method). Again, it's important to use DeferRefresh. For 2017 v1 release we worked on performance optimization and got significant improvements. Below are comparison charts showing the difference comparing with 2016 v2 release. You see that sorting and grouping show some degradation depending on data size. This is limitation of the current C1CollectionView implementation. It uses a generic approach based on SortDescriptions, GroupDescriptions and reflection. If sorting performance on big data is critical for your application, it's possible to set C1CollectionView.CustomSort property to your custom IComparer implementation. As it doesn't need reflection, it works much faster. All results were get from release version compiled with .Net Native tool chain. It is important as that is what your customers will get from Windows Store. If you try to repeat tests on your machine, please always check the list of currently running processes. I noticed that every time I rebuild and run the UWP application, Windows starts a 'Microsoft Compatibility Telemetry' process, which eats up a lot of CPU and affects application performance badly. You need to stop it before running tests or you'll get incomparable results. Windows is not a real-time OS, so you might also have other running processes that affect application performance. Try to keep the same small set of running processes when you repeat tests.